To bring into close association lawyers in Baltimore City and surrounding counties whose practice consists chiefly in representing insurance companies and other corporate defendants in damage suits and other litigation in order to promote the efficiency of the legal profession in dealing with common problems and in serving the general interest of the clients of the members. At the first annual meeting on May 27, 1963, Thomas Raeburn White, Jr., the president of the Philadelphia Association of Defense Trial Counsel, spoke on the goals and accomplishments of the Philadelphia organization. The following officers were elected: President—John H. Mudd; Vice-President—M. King Hill, Jr.; Secretary—Edward J. Thompson; and Treasurer—Raymond A. Richards. Four standing committees were created: Program and Education; Legislation; Public Relations; and Membership. In our inaugural year the organization had approximately 30 members, and most were associated with the law firms Whiteford, Taylor; Smith, Somerville & Case; Semmes, Bowen and Semmes; Ober, Grimes; O’Doherty, Gallagher and Nead; Rollins, Smalkin; and Lord, Whip. The membership fee was $10. In just one year the organization nearly doubled in size to 60 members. 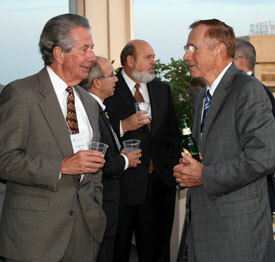 Between the mid-60’s and the mid-70’s, the Association’s agenda continued to be informal. In addition to the crab feast, the group met three or four times a year. Typically, a member would speak on developments in the law or provide a legislative update. Up until 1977, the Association’s membership was primarily from the metropolitan area. There was a strong contingent from Annapolis and a few members from Prince George’s County and Frederick. In 1977, members from the Suburban Defense Trial Lawyers Association and the Association of Defense Trial Counsel (Metropolitan Baltimore) met to adopt proposed by-laws for a statewide group. A separate organization, the Maryland Association of Defense Trial Counsel (MADTC), was established in an effort to heighten the influence of the defense bar. A statewide defense organization would permit the defense community to lobby more effectively, to collect more information on medical experts, and to keep advised of current ideas and trends. The first general meeting was held at the Carousel Hotel in Ocean City, Maryland in 1979. In 1983 the Association published the inaugural issue of Defense Line. An Appellate Practice Committee was formed, but was not called upon until several years later when it filed a brief amicus curiae in O’Donnell v. McGann in the Court of Appeals of Maryland, September Term 1986. The case dealt with appellate rules of procedure that impacted harshly on defendants in civil suits. Up until 1987, the Association’s Legislative Committee performed a “watchdog” role by monitoring legislation and addressing issues of concern to the defense bar. As ATLA grew in size, the MADTC hired a lobbyist to promote defense interests in the state legislature. At about the same time, the Association began funding a PAC to further its work in Annapolis. As the decade drew to a close, the Association began publishing an annual Membership Directory. Early in 1990, MADTC hired an Executive Director to handle the increased administrative matters that are associated with a larger membership. The MADTC also formed a Judicial Selections Committee, becoming one of the first defense organizations in the nation to take on the colossal task. The Committee is charged with interviewing and endorsing candidates for judicial office. In 1997, the MADTC officially changed its name to Maryland Defense Counsel, Inc. This change was made to highlight our defense orientation. In the year 2000, membership grew dramatically with an increase of almost 50% through an innovative and aggressive membership drive. The MDC went into cyber space in 2001 when it launched its first website at www.mddefensecounsel.org. Since then, we’ve expanded the electronic benefits to all MDC members. In 2004 we gathered information about practice areas, listed the members by county, and identified former law clerks. The new member directory put this information at the members’ fingertips through a searchable database. To enhance marketing opportunities, we provided direct e-mail links to the members individually and to their firm’s websites. Efforts to improve the administration of justice have been ongoing—from an all day symposium in conjunction with the MTLA to address all facets of the civil jury system in Maryland to a specially appointed MDC subcommittee to improve and streamline our process of reviewing judicial candidates. In 2005, MDC created the Civil Justice Project, an ad hoc effort to pass legislation correcting several failures in civil Justice in Maryland. Throughout the second half of the decade, MDC worked with the judiciary in ASTAR—the Advanced Science and Technology Adjudication Resources project—to prepare judges to be better and more effective adjudicators when they encounter cases presenting scientific and technical evidence and issues; to serve as resources to their judicial colleagues; and to encourage authorship of scholarly articles and liaisons with the bar and law schools on related topics. In 2007 MDC won the prestigious Rudolph A. Janata Award from Defense Research Institute for its contributions to ASTAR. 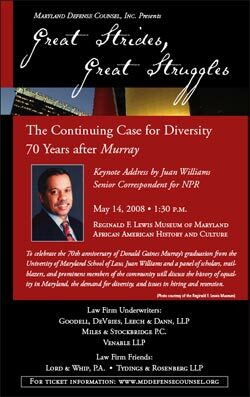 In its continuing commitment to diversity, the MDC hosted a symposium entitled Great Strides, Great Struggles: The Continuing Case for Diversity 70 Years after Murray at the Reginald F. Lewis Museum of Maryland African American History and Culture in May 2008. Scholars, trailblazers, and prominent members of the community discussed the history of equality in Maryland, the demand for diversity, and issues in hiring and retention. The keynote address was delivered by Juan Williams, NPR Senior Correspondent, Morning Edition, and critically acclaimed author of Thurgood Marshall: American Revolutionary and Eyes on the Prize: America’s Civil Rights Years, 1954–1965. 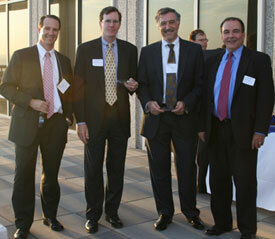 For this event and our efforts to promote inclusion, the MDC received the Diversity Award from the DRI. 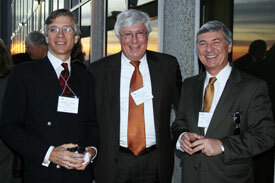 In 2009 MDC brought together leading Maryland judges and lawyers for a.Leadership Conference. 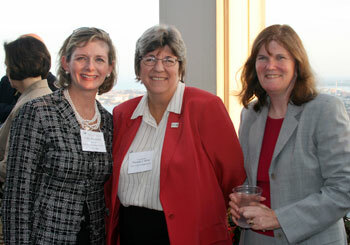 The Honorable Lynne A. Battaglia of the Maryland Court of Appeals presented the history of women lawyers in Maryland. Afterwards she was joined by a panel of leading Maryland judges and lawyers including The Honorable Pamela White, Neal M. Brown, Esquire, Andrea Leahy-Fucheck, Esquire, Ava Lias-Booker, Esquire and Jennifer S. Lubinski, Esquire, who discussed career growth, gaining and maintaining visibility, developing mentoring relationships, strategies for practice development, and the importance of developing leadership skills, particularly for women. The Maryland State Bar Association awarded MDC the Service to the Bar Award for its 2011 Trial Academy, a full day devoted to trials and the skills needed to win them. The first Academy provided an overview of the elements of a trial. The second Trial Academy was held April 2012 and built on the skills learned the prior year. The 2012 panel of distinguished speakers and practicing litigators conducted demonstrations of opening statements, examinations and closing arguments based upon a fictional fact pattern of an auto accident case. In 2015, the MSBA again awarded MDC with its Best Service to the Bar Project Award. The Trial Academy is held every spring.